Thank you to everyone who’s read my blog this year. My plan is to generate plenty of thought-provoking reading in 2012. If you have any thoughts or comments, please let me know! I’m happy to write some posts based on readers’ suggestions. I will be out of town and mostly away from a computer – so I’m doubtful I’ll have an opportunity to write another post this year. So have a merry Christmas and a happy new year !! (Dare I say that in today’s PC world?) If that greeting doesn’t apply, then happy holidays to you and yours. In the past 40 years, scientists have developed ways to immunize against more than a dozen life-threatening diseases. Yet, according to the Milwaukee Journal-Sentinel, we are no closer to identifying those with mental illness who are dangerous than in 1971, when schoolteacher Alberta Lessard won a groundbreaking legal case that prohibited states from forcing people into care. That decision required a judge to find a person to be an imminent physical danger in order to compel treatment. It took the decision making away from families and doctors and put it in the hands of police officers and judges. Without a precise way to measure dangerousness, people who need care may slip through the system with tragic results like those at Virginia Tech and Tucson. Shrouded in stigma and secrecy, illnesses that affect the brain long have been regarded as distinct from other health issues such as cancer and heart disease. Psychiatric hospitals are separate from other health facilities. Until recently, insurance rarely covered many mental health claims. It’s been only 30 years since the Diagnostic and Statistical Manual – a benchmark used by doctors to identify diseases and conditions – defined objective criteria for what constitutes a mental illness. Without data to develop sound social policy, lawmakers have had to guess at where to draw the line between protecting the public and safeguarding individual rights. That has created a fragmented system with a patchwork of approaches. Even within a state, the way cases are handled can be determined by where a person lives. When incidents such as Virginia Tech or Tucson happen, it reignites an entrenched debate about how best to approach the issue. For more on this special report, including a 6-minute video and other resources, see Wednesday’ (Dec. 14) story, “Identifying, protecting people with mental illness” on the home page of the Milwaukee Journal-Sentinel – www.jsonline.com. It is a comprehensive report that sheds light on a topic that working professionals are aware of, but which the general public often knows next to nothing about. Attendance Optional at the Office Holiday Party? Will skipping the holiday party at work land you on the boss’s “naughty list”? Not necessarily, according to a new OfficeTeam survey. More than six in 10 (61 percent) executives whose companies host holiday parties said there’s no unwritten rule requiring employees to attend. But that doesn’t mean staff should miss out on the merriment: Thirty-eight percent of respondents indicated that making an appearance is expected. “Although many executives take a casual approach to holiday festivities and aren’t concerned about attendance, some managers pay attention to who shows up,” said Robert Hosking, executive director of OfficeTeam. 1. Mix it up. 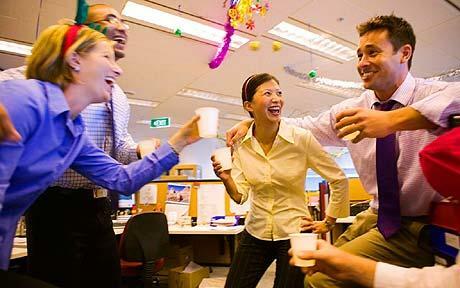 Mingle with co-workers outside your usual circle. 2. Work the room. Try not to monopolize anyone’s time. Shorter chats allow you to meet more people. 3. Limit shoptalk. Don’t focus on business the whole time. Come with conversation starters in mind, such as people’s holiday plans or New Year’s resolutions. 4. Don’t be a grinch. Keep your discussions positive and upbeat. No one wants to listen to complaints. Avoid controversial topics such as politics, too. 5. End on a high note. Show your appreciation to the host and others who worked on the event by thanking them in person or sending an email afterward.